In this dish, carrots and parsnips combine to form a subtly sweet flavour– the perfect sides to a simply grilled scotch fillet. Everything is tied together nicely with a toasty cranberry and walnut beurre noisette (warm butter sauce). This dish is the perfect way to start a great week. Share the moment #youplateit on Instagram and enjoy! Preheat oven to 180°C. Wash the fresh produce. Peel and finely dice shallot. Peel carrot and parsnips. Remove ends and cut carrot and parsnip in quarters lengthwise (cutting middle core out of parsnip). Roughly chop walnuts. Cut tomato in half. Remove thyme leaves and discard the stalks. (TIP: we prefer to remove the core of the parsnip as it can be a little tough and fibrous). Place parsnips, carrots, and tomatoes on a lined baking tray and toss with olive oil, thyme, salt and pepper. Roast in oven for 25 minutes, until tender. Pat dry steak on a paper towel. Season steak on both sides with salt. Heat olive oil in a pan over medium-high heat. When oil is shimmering, add steak and cook 2 - 3 minutes before flipping. Flip 3 times for a total cooking time of 10 - 12 minutes (or to your preferred doneness). Remove from pan and allow to rest. (TIP: we supply our meat as a thick-cut piece, as we think it cooks much better as a bigger piece. You can always cut into thinner steaks if preferred, but bear in mind you will have to keep a closer eye on it to reach your desired doneness). Place pan used to cook steaks back over medium heat and add butter. Cook butter until it begins to turn brown, about 2 - 3 minutes. Add shallots (to taste), walnuts, and cranberries to pan and cook for an additional minute, or until walnuts are toasted. Add 2 TBS water and stir. Season with a pinch of salt and pepper. Remove from heat and reserve. Slice steaks as desired. 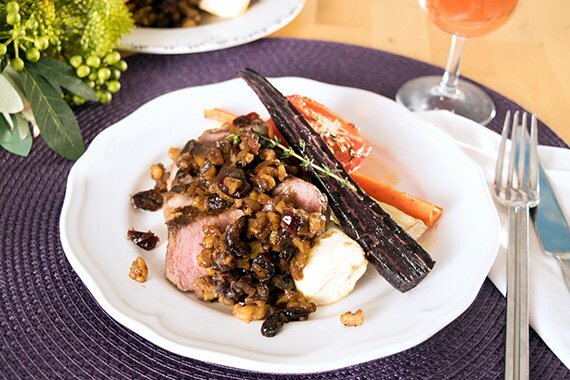 Make a bed of carrots and parsnip on plates, add tomatoes and top with steak and garnish with walnut/cranberry sauce. Enjoy!